Full Disclosure: I’m a longtime customer of Wells Fargo. And I have a client who does a great deal of business with Wells Fargo. But earlier this week a report by Chris Arnold on NPR News stopped me in my tracks. So what happened is predictable – Wells Fargo salespeople started “achieving their goals” by signing customers up for services that they hadn’t requested. In massive numbers. How did customers let that happen? One example: a person applying for a home equity loan would also be signed up for a personal line of credit … and might not even have noticed that additional service as they were signing the paperwork for the house loan they needed. I personally recall receiving a debit card I hadn’t requested. Of course, opening accounts without people’s knowledge is wrong. It’s important to note that Wells Fargo is not admitting any wrongdoing in the settlement. But they are paying $185 million. As a sales coach, I regularly see senior leaders set very high sales goals. I often wonder if they themselves could achieve such high targets – but the reality is that they’re chasing profit growth in every quarter, and many feel they’ve cut all the fat from their costs, so the only way to drive profit growth is to ratchet up sales. The frontline salespeople will just have to make the numbers. Now we learn that sometimes if leaders aren’t mindful, many of their front-line salespeople can get crushed in the process. I am often brought in to improve sales results, and I usually recommend that the business look at Key Performance Indicators (KPIs) for their sales efforts. Of course, all most leaders seem to care about is “closed business” – but I argue that that is a historical measure: either enough business was closed, or it wasn’t. It’s also interesting to know about activities undertaken in pursuit of more business: outreach to potential future clients, for example; effective follow-up with those people; keeping in touch with past clients so you’ll be top-of-mind when interest in what you have to offer, or another need, arises; time spent speaking with those who make decisions about buying what you have to sell. Looking at these KPIs is a good indicator of the likelihood of future sales, and if they’re not looking good, they’re an early warning that something needs to change, or goals are at risk. The NPR story pointed out that the controversial sales efforts were being conducted in Wells Fargo’s headquarters – with the CEO and Senior Management Team just upstairs. I’m not surprised. I know a lot of senior leaders who are only too happy to establish, or endorse, very high sales goals for their teams. Unfortunately, many senior leaders, perhaps the Wells Fargo execs included, have no idea how difficult it will be to achieve such goals in today’s business marketplace. Yes, they SHOULD know. It’s their duty to know. But it’s easy to fall out of touch on these issues when you aren’t actively selling anymore and you’re not being diligent about staying informed and connected. That’s one thing my clients count on me to do: help them keep up-to-date on today’s business marketplace, aware of what other organizations are seeing and doing to successfully drive sales, what research is telling us, and what sales targets seem beyond the realm of reasonableness. With that process, they’re less likely to become another Wells Fargo. 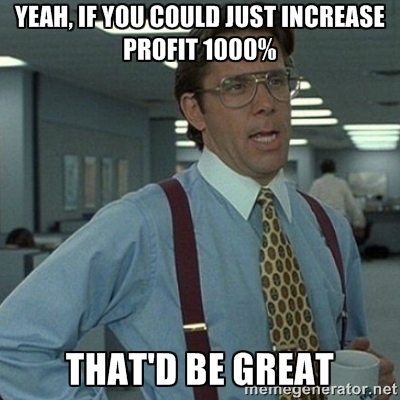 I let them know when their lofty sales goals might bring more headaches than profits. It’s just not a “smile and dial” world anymore. People are skeptical and cynical – particularly about salespeople – and their guard is up, perhaps more so now that the Wells Fargo information has come to light. They are slow to trust – and once they do trust you, that trust can easily be destroyed. The two most valuable things in business, right now, are trust and attention. Both are hard to get – we’re slow to trust and often distracted. But it’s worthwhile to think about actions you’re considering taking from the point of view of whether they’ll build or destroy trust – not just whether they’ll get you attention.